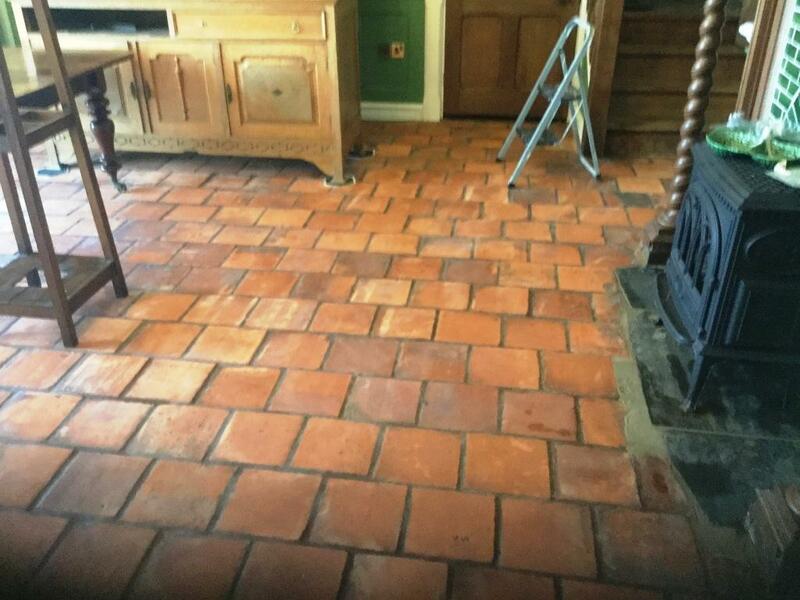 This lovely old Spanish Terracotta tiled floor was installed at a house in Swansea. Over the years the sealer had worn down and dirt had become ingrained in the pores of the clay tile making it impossible to clean effectively. The owner called me in to give the tiles a really deep clean and bring the floor back to its former glory. I went round to take a look at the floor and carried out a cleaning test of the tiles with a medium strength dilution of Tile Doctor Pro-Clean scrubbed into the tiles by hand. This demonstrates to the customer how the floor could look, and it also helps me to work out which product will work best as well as the likely quantities required for the quote. 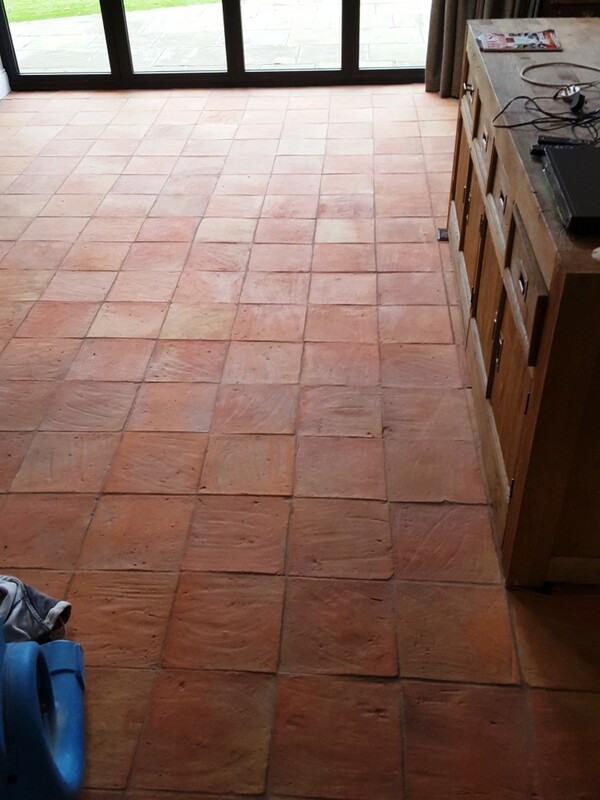 The Terracotta tile and Grout in the test area came out well and after showing the customer the result and working out a price for the whole floor and he was happy to book me in. On my return I continued with the cleaning process using more Tile Doctor Pro-Clean but this time I left it to soak into the floor for longer and was assisted by a Black Scrubbing pad attached to a rotary buffing machine. I like to use a slow speed buffing machine for this process as it makes less mess than a high speed and this keeps my customers happy. It wasn’t long before the cleaning solution changed colour with the dirt that was becoming released from the floor. The dirt was then rinsed off the floor using water and a wet vacuum, and the process repeated until I was happy the tiles were clean. The next step was to clean the grout lines, this task is best done by hand with a stiff brush and more Pro-Clean as the scrubbing pads struggle to reach into the recesses of the grout line. Once I had finished the cleaning I rinsed the floor down several times with water, to make sure all traces of Pro-Clean were removed. The cleaning process took up most of the day and the Terracotta would need to be dry before being sealed so I before leaving it to dry off fully overnight I covered the floor with a clean linen dust sheet (not plastic) to protect it overnight. This allows evaporation to continue whilst protecting it from getting dirty again. The next day i came back and took some moisture readings to make sure the floor had dried out. Most of the readings were fine apart from a few edges and corners where the moisture must have settled; I used a heat gun on these areas to ensure these areas were dry before starting with sealing. 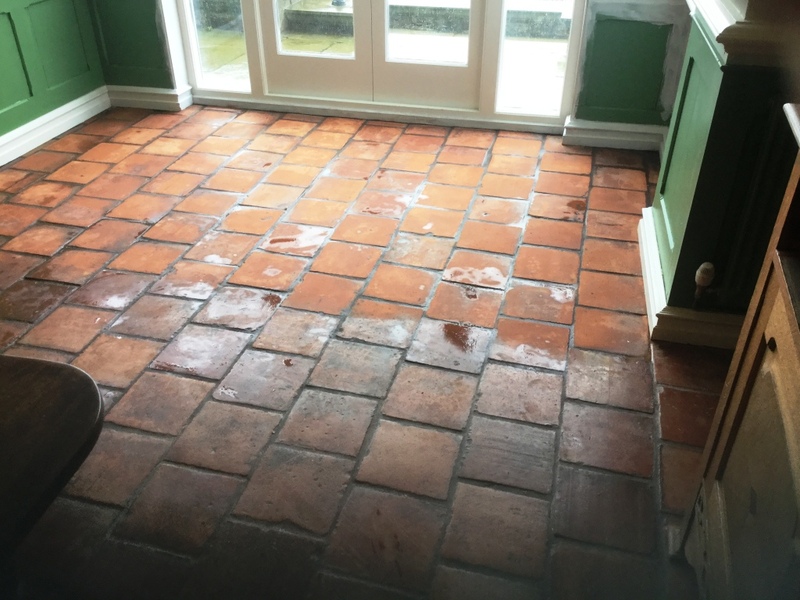 Terracotta is a very porous clay in its unsealed state, so I like to put down a coat of Impregnating sealer first called Tile Doctor Colour Grow. Colour Grow works by occupying the pores in the tile making a good base, it also has the added benefit of enhancing the natural colours in the clay tiles. After leaving it to soak into the tiles for about ten minutes I removed the excess Colour Grow with a cloth and started to apply a Topical sealer Called Tie Doctor High Shine. The customer had requested a high sheen finish, so after several coats of this the job was completed and looking a million times better than before. I left the customer a complimentary bottle of Tile Doctor Concentrated Neutral cleaner for aftercare. We recommend using this product for the regular cleaning of sealed tiles, being pH neutral is doesn’t eat into the sealer prematurely reducing its longevity like your regular acidic cleaning products. 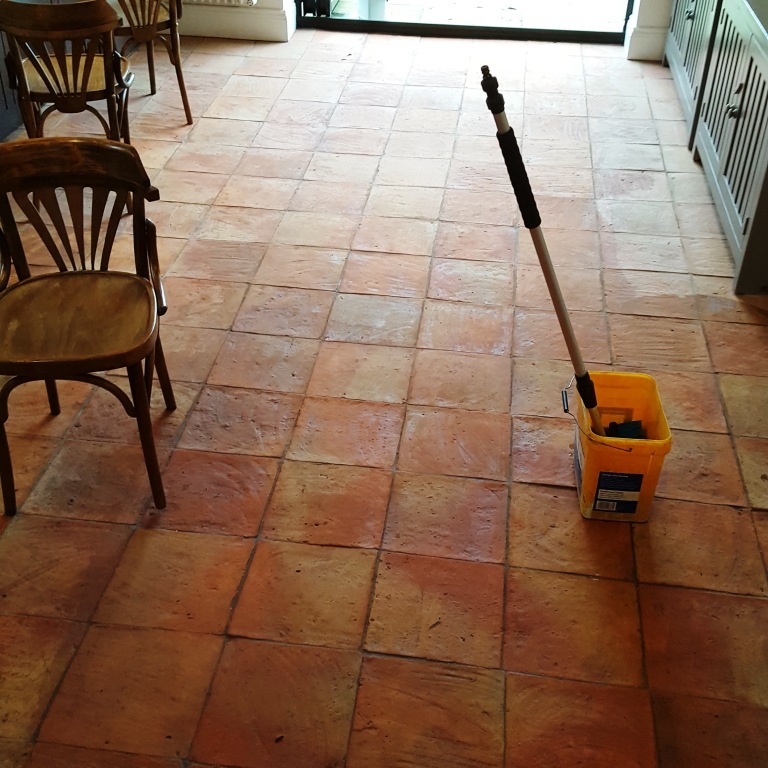 According to the Mirror Newspaper Alderley Edge with its restaurants and bars is a playground for footballers; well I certainly didn’t bump into any on a recent visit there to clean and seal this lovely Spanish Terracotta Tiled Kitchen floor. Joking aside it is a very nice area and fortunately for me the residents are very partial to stone floors. 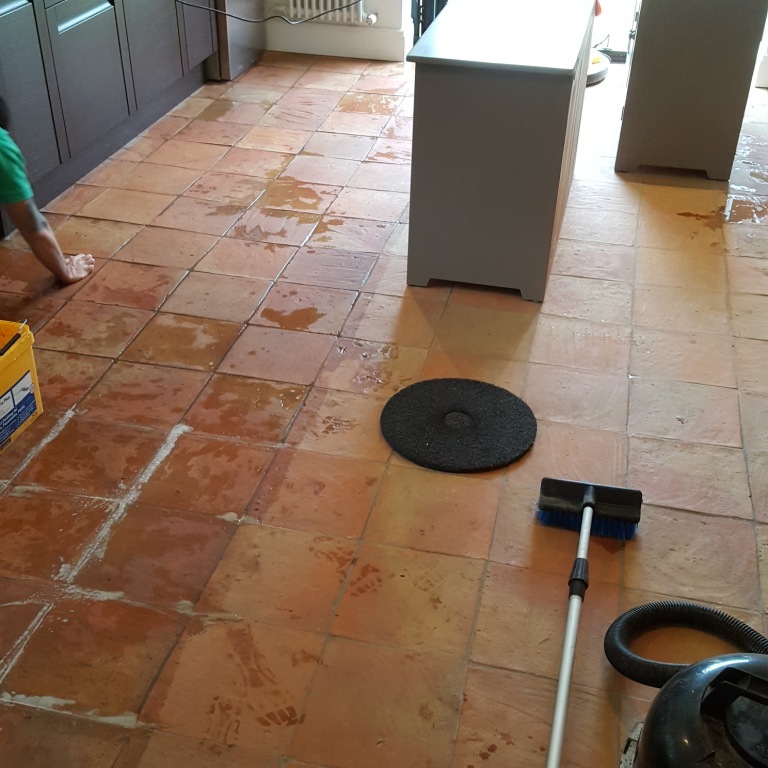 Getting back to the post, we were asked for advice on cleaning and sealing ninety square metres of Spanish Terracotta tiles that had been installed in this kitchen four years prior. The sealer had since worn off and the floor was becoming difficult to clean effectively. 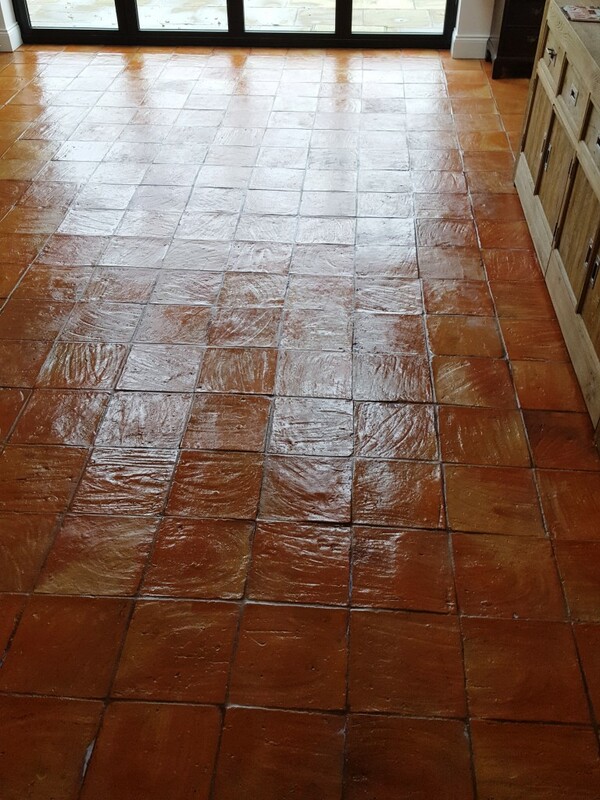 Terracotta tiles are made from soft clay making it very porous and likely to absorb anything that lands on it; as a result, it’s important to maintain the sealer to stop this happening. To clean the floor, I soaked the tiles in a strong dilution of Tile Doctor Remove and Go which is a strong stripping and cleaning solution which removes old sealers and also draws out ingrained stains. After twenty to thirty minutes the solution was worked into the tiles using a black scrubbing pad fitted to a rotary machine. The soiled solution was then removed with a wet vacuum and this was followed by scrubbing the grout lines with Tile Doctor Pro-Clean and a grout brush until they were clean. The whole floor was then rinsed with water to remove any soil and trace of cleaning product. The water was then extracted using the wet vacuum. The floor was then checked to make sure it was as clean as it could be and stubborn areas spot treated. The floor was left to dry off overnight and we returned the next day and tested the tiles with a damp meter making sure it was dry before we could seal it. To seal the floor I first applied a single coat of Tile Doctor Colour Grow which soaks into the pores of the tile to enhance its colours. Once this was dry it was followed up by multiple coats of Tile Doctor Seal and Go which adds further protection and adds a nice sheen to the tile. 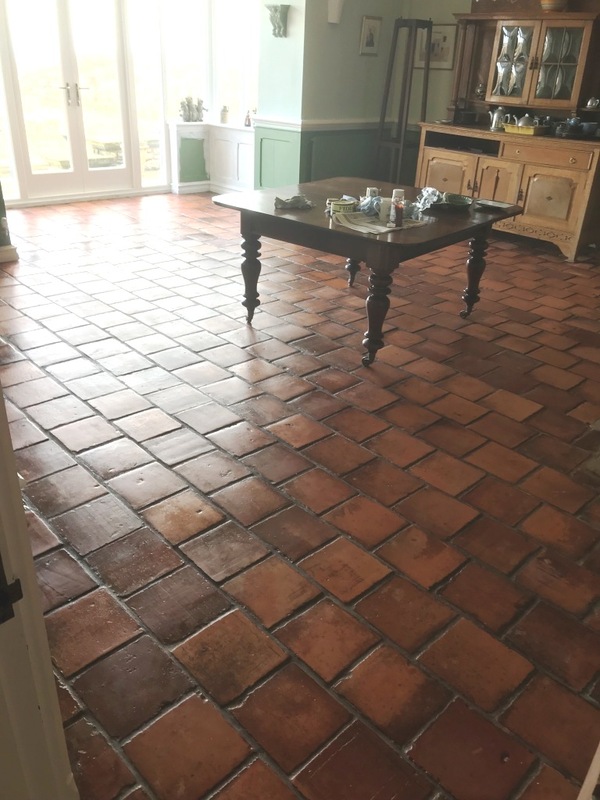 I took some time to complete due to the porosity of the Terracotta requiring nine coats before the tiles were fully sealed but once done it was transformed and I left a very happy costumer. A quick tip here is that you can always tell when a tile is fully sealed by adding a small drop of water to the tile, if it forms into a bubble then it’s fully sealed.